The poster at the top of this article is an Afrikaans recruitment poster in WW2. The face at the top of it is that of Paul Kruger the last President of the Boer Republic that the British destroyed. 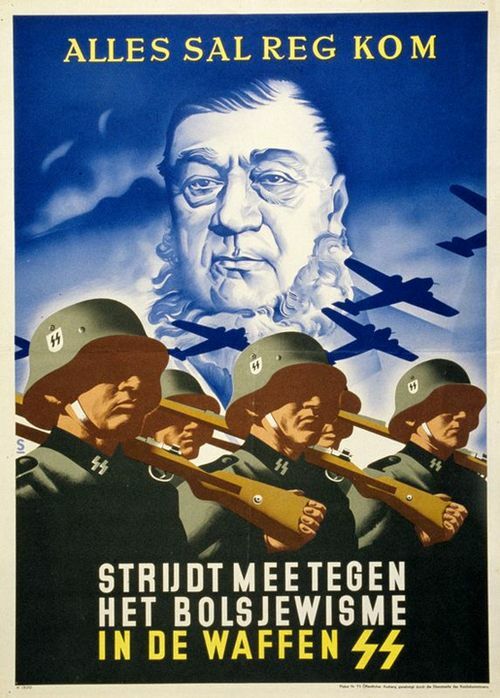 It reads: “Alles sal reg regkom” and below: “Strijdt meetegen het Bolsjewisme in die Waffen SS” which translates as: “Everything will be all right – Fight against Bolshevism in the Waffen-SS”. Sadly I don’t think any Boers actually joined the Waffen SS, although a few Boers were converts to NAZISM like the boxer Robbie Leibrandt. If only the Boers had then listened and realised that Jewish Bolshevism (communism) would come to eventually destroy us too! In this video Alfred Schaefer and I talk about the things that are happening in our respective countries. The Jews are trying to get Alfred Schaefer and his sister into jail for 6,000,000 years! Alfred goes on trial in Dresden on 5th May 2018. I discuss my trip to Coligny, Lichtenburg and the farming areas of the North West Province which has seen a lot of violence lately. Alfred as always has advice for the Boers. We discuss our common racial enemies. ← Jew scum hound 94 yo Canadian German to lose his citizenship for 4th time! – Jail in Germany? What a great show, Jan. I always enjoy the energy that Alfred brings. Thanks again.